Cruzar o Delta do Mekong e explorar os túneis de Cu Chi são dois dos passeios de um dia mais populares da cidade de Ho Chi Minh, e este passeio de dois dias de grande valor inclui ambos. 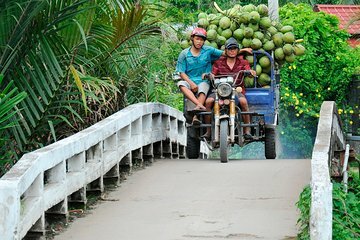 Aventure-se nos túneis históricos de guerra, aproveite os passeios turísticos na cidade de Ho Chi Minh e descubra as aldeias do Mekong de bicicleta, riquixá e sampana. A excursão inclui a coleta do hotel, almoços e taxas de entrada, mas a acomodação não está incluída. So interesting and so much fun! It even rained on us during the bicycle tour of the Mekong Delta and we still had a great time . Our guide was so knowledgeable, friendly and witty. The tunnels were an amazing experience. Seeing the environment first hand, helped me understand how so many soldiers suffer from PTSD. What an awful experience that must've been. The city tour was a separate guide and he was so full of information. Very informative and super happy we did this 2 day tour. We enjoyed the 2-day tour immensely our tour guide Roy was very informative about life in Vietnam, its history, geopolitics etc. He was well informed about current events in other regions of Vietnam. He spoke English very well and had a great sense of humor!! Every aspect of the trip was well organized and lunch was delicious, all typical Vietnamese cuisine! We highly recommend this tour! It was a good small group tour. The tour guides are helpful, friendly and informative. The first day was a trip to the Chu Chi Tunnels and in the afternoon was the city ride. It was an informative and compact excursion and we stopped along the way for short breaks. The second day was also fruitful, I enjoyed the bicycle ride along the villagers homes to see their peaceful, laid-back lifestyles wished it was a longer route though. We sailed on the little boats along the Mekong River and strolled through the Coconut Village. We had enough to eat and drink, so yes, it is a recommended trip. A very big thank you and many blessings to the tour guides. Excellent 2 days! See all the great attractions in one tour booking. Our guide Tam was fantastic, knowledgable and good fun - we learned a lot about Vietnamese history, culture and way of life. We even got great restaurant recommendations for good restaurants! This tour is highly recommended. Jack, the tour guide, was so nice, full of values and respect, accommodating, and most of all, knowledgeable. My family wouldn't have enjoyed our short stay in Saigon if it weren't for Jack guiding us in all the places we went to. The tour is informative and such a great cultural experience. It gives you an excellent perspective of the vast culture and history of Vietnam.